The Network view shows how the nodes in a JustNN neural network are interconnected. A new neural network can be created from the Grid by pressing the New Network toolbar button or selecting Action > New Network. This will produce the New Network dialog. This dialog allows the neural network configuration to be specified. The dialog will already contain the necessary information to generate a neural network that will be capable of learning the information in the Grid. However, the generated network may take a long time to learn and it may give poor results when tested. A better neural network can be generated by checking Grow hidden layer 1 and allowing JustNN to determine the optimum number of nodes and connections. It is rarely necessary to have more than one layer of hidden nodes but JustNN will generate two or three hidden layers if Grow hidden layer 2 and Grow hidden layer 3 are checked. The time that JustNN will spend looking for the optimum network can be controlled by setting the Growth rate variables. Every time that the period expires JustNN will generate a new neural network slightly different from the previous one. The best network is saved. Hidden nodes are fully connected to input nodes, output nodes or other layers of hidden nodes. Output nodes are connected to the output columns in the grid. The input layer is fully connected to the first hidden layer. 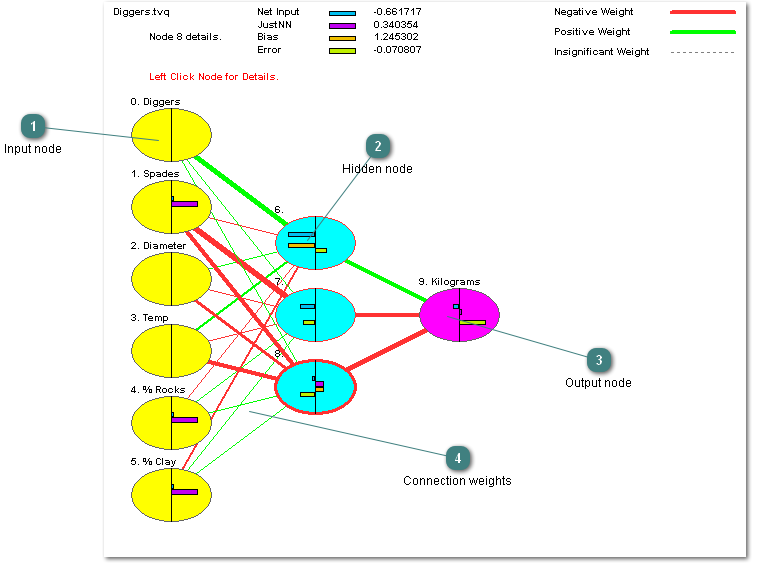 Each connection has a weight that is updated while the network is learning. Hidden layers are fully connected the next hidden layer or the output layer.